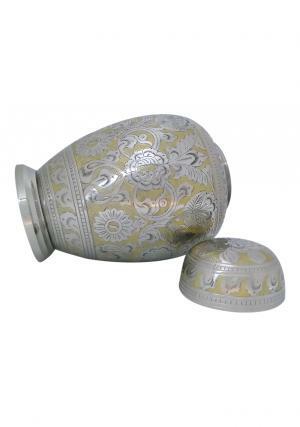 Silver Dynasty Yellow Engraved Adult Urn for Cremation ashes is a brass made metal memorial urn with nickel finish. The encryption on the urn is with flower and yellow finish. 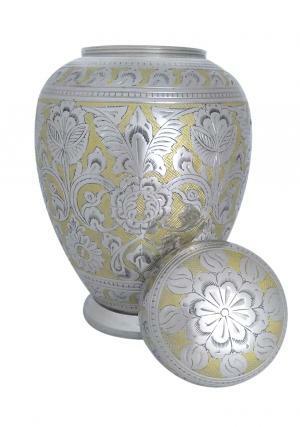 The artwork on the adult urn is is encrypted from skilled professionals with unique design on a full filled urn. Large adult funeral urn with decorated bands of silver circled around and lid embraced of yellow, silver encryptions with a screw threading to secure the ashes inside the urn. 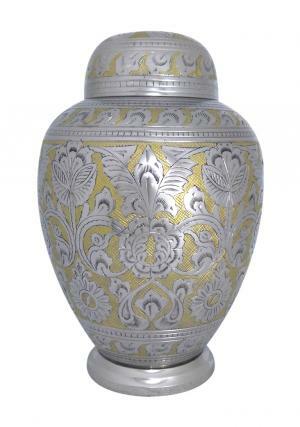 The Silver Adult Yellow engraved Funeral urn weighs 2.3 kg and measures 200 cubic inch of adult ashes approximately. 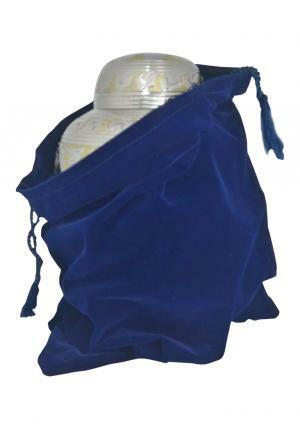 The length of the adult urn is 10.6 inch in height and 6.8 inch in width approximately.